Galen Fendrich, 75, of Linwood, died at his home on Thursday, April 20, 2017 after battling health issues the past few years. Funeral Service Saturday, April 29, 2017 11:00 A.M.
Galen was born February 6, 1942, in Prague to Jerry and Pearl(Kaspar) Fendrich, delivered by his grandfather Dr. Joseph Kaspar. He attended grade school in Abie and graduated from Prague High School. He was very active in basketball and track. On November 25, 1961, he married Joan Prochaska. They had two children and later divorced. Galen was a farmer and raised cattle and hogs. 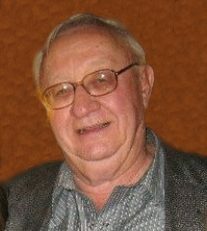 He was also the owner and operator of Czechland Inn in Prague for several years. He loved to build terraces and ponds with his dozer, loved to fish and boat with his grandchildren and enjoyed airplanes. He was a pilot and flew a J3 Cub and a Tri Pacer. He later enjoyed flying his model airplanes. (which he built) His greatest love was spending time with his grandchildren.